I’m probably the youngest of the Gen X generation (people define the age groups differently, but the behavioral traits and beliefs are perhaps the most telling) and we’ve a unique way of growing up with Transformers, GIJoe, My Little Pony, Reading Rainbow, Regan’s Just Say No, and of course Michael Jackson (when he was black). We also grew up with technology: Nintendo games and “↑ ↑ ↓ ↓ ← → ← → B A”, boomboxes, Sony Walkmen and of course MTV and VH1 –or, at least that’s all that comes to my mind during my growing up experience. Fast forward to 2009, we’re establishing ourselves in the workplace, becoming the successful professionals as we enter the early or mid-career phase of our lives. Yet with maturity comes the big “R” of responsibility: family, kids, the access to disposable income. As this generation, my generation, moves into the prime light, brands are also recognizing the importance to reach us, so I’m seeking your help to submit information. I’m seeking examples from brands or agencies that have case studies of how brands have reached Generation X (my Generation) by using social media. This doesn’t have to be a formal PDF, but it’s most helpful if you include URLs or screenshots, a problem definition, a goal, and then measurable quantitative results. I’m seeking these within the next two weeks so by June 15th will be the last day to email me at jowyang at forrester.com. Oh, and to kick off a conversation, how would Gen Xers behave if we had the internet when we grew up, rather than in just the last decade and half? From turntables, cable tv, to compact discs, we mainly grew up as consumers of technology and media –not creators. We grew up with technology as consumer products, yet in many cases, these devices were not connected, not networked, and not tied together through the internet or wireless technology (we were often ‘nodes’ not networked). Do you think Gen Xers would use it differently than Gen Y? Would we be as willing to share all parts of our personal and social lives as some of our younger counterparts? You can learn more about how different generations around the globe access social technologies using our social technographics profile tool, love to hear your thoughts. 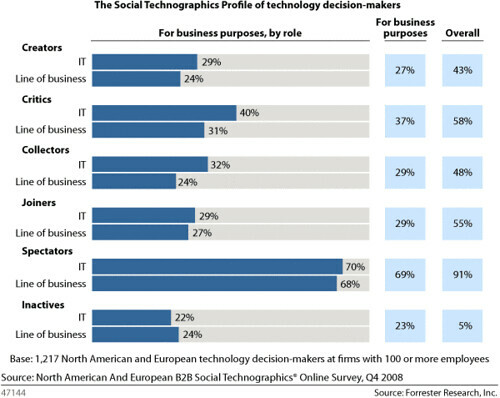 91% of these technology decision-makers were Spectators — the highest number I’ve ever seen in a Social Technographics Profile. This means you can count on the fact that your buyers are reading blogs, watching user generated video, and participating in other social media. Note that 69% of them said they were using this technology for business purposes. Only 5% are non-participants (Inactives). 55% of these decision-makers were in social networks (Joiners) — despite as mature businesspeople and not college students, you’d think they’d be participating a lot less. Above: Oliver Young has created a slideshare deck, thumb through it to learn more. If your boss isn’t sure if social media is right for you, forward them this data and check out the full report, or download a free copy after registration. Data is a powerful tool (more than a panel of ‘social media gurus’) so use it to make business decisions –go beyond gut instincts and opinions. Despite’s Wired’s opinion piece that blogging is waning (they cite no data), perhaps some of the most important data for this year is this recently released Social Technographic Data from colleague Josh Bernoff showing an increase in adoption in United States of Social Technographics from 2007-2008. He points out that inactives (people that cannot be reached through social technologies) has reduced from 44% to 25%. This means that three fourths of the US online users is touched by social technologies. Also note that more people who consume this content has increased from 48% to 69%. Do note that to be accurate in your marketing, like you have specific personas for your marketing efforts, you’ll need the same technographic profiles for those personas. Age, culture, professional, and other factors all play into each technographic ladder. There’s so much more to explore here, from specific cultures, regions, age groups, but looking at this bigger picture of a one year trend tells a bigger story –adoption so far, has increased. I also recommend you read Sifry’s state of the global blogosphere as well as access more social technographic data (now including Canada) at the profile tool, at no charge. Does your marketing efforts match the changes in online consumer behavior? Should we expect this to plateau? if so when? At what point will we see a decrease, if at all? Are you prepared to answer these four questions of social media in an economic downturn? Are you and your company ready to address these social media challenges? And yeah, they had to patch me onto the show, they must have had me on mute –insert joke below in comments, I need a bit of humility once in a while. 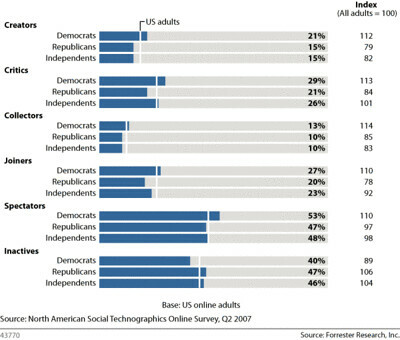 Does the Social Media Space tend to skew Democratic? I’ve noticed for some time that the web industry tends to skew very liberal and democratic, you certainly see elements of this within Digg, for example, I did an advanced query of dugg (voted) stories that got on the front page, (title only) and McCain has 42 pages (many stories are negative), and “Obama” has 65 pages (mixed bag of content). Does sentiment tell us much? Yet frequency isn’t telling, and sentiment is. Last night, I asked the community around me in Friendfeed to list out three keywords what come to mind in this association test for both parties. You can read the Republican, and Democratic responses –nearly opposite. Update: I’ve asked my Friendfeed network to think about why there’s strong liberal sentiment in FF, read their responses. Why does the social space (or at least my network) tend to skew so left? It could be a number of factors from age, willingness to adopt change, or that the ideology of the very social web in it’s essence could be core to liberal beliefs. In fact, if you read a book on blogging or social media marketing, you could quickly transplant the words “company” for “government” and the book would still read very logically. Is it because there may be many Republicans in Silicon Valley? Yet despite this lean from the left within my social media network, I do remember during the last election that a great deal of republican votes came from the Silicon Valley. I remember my friends who worked at NASA, Boeing, Lockheed, that were strongly encouraged by their management to vote Republican, as it would increase the eventual spending in the aerospace and hi-tech sector. Many of these companies have large headquarters in the Mountain View area, with thousands of companies supporting this eco-system, in fact read this 2004 article from the last election which profiles ‘sheepish republicans’ in Silicon Valley, it’s an interesting mix here in the valley as while folks make swing left in ideology, many are very wealthy. Is it adoption of Obama and McCain Social Media? Not all is lost by the Republicans in this space, this article by Techpresident (Which is indexing and commenting on the the digital marketing efforts of each candidate) suggests that even though Obama may have a grass roots lead within social media and dedicated staff (including Facebook co-founder), McCain’s supporters could master the tide by creating an API and encouraging the movement to create their own applications. Or is it speed of adoption of these tools? If speed is any type of indicator of adoption of social marketing, McCain just launched their online community on the campaign domain, called McCain Space, Yet Obama’s campaign has been up and running with MyBarackObama for some time. In Josh’s analysis, he points out that the tendency to Join (be in a social network) between Obama supporters and McCain supporters is nearly a margin of 13%, which isn’t a lot but given that across the board Obama members are more particiaotpry in soical technographics than McCain supporters they’re more able to energize their base. Perhaps the most telling is the Spectator behavior, which indicates which support group is more likely to consume citizen created content. Nearly tho-thirds of Obama, (59%) consume social content, and less than half of McCain (44%) supporters will consume social content, a margin that straddles the half way mark. Data about overall existing behaviors of users (technographics) are perhaps a key indicator that demonstrates why one party may have an advantage in social marketing. In typical internet humor, a meme called “Little known facts about Sarah Palin” continues to spread throughout twitter. Given her largely unknown background, the twittersphere has had fun creating her background for her. The above is just cursory observations, had I more time I would love to do a more formal study on this specific vertical, maybe in four years. I’m here in SF at the F8 developer conference sponsored by Facebook. While the primary thrust of F8 Facebook announcements was for developers, I mentally translate what this means for web strategists at brands at Fortune 5000s. Essentially, the Facebook experience extends further into the web –beyond their walled garden. Similair to OpenId (which coincidently was adopted by competitor MySpace) third party developers can allow website visitors to login to their website using their Facebook ID. This “Passport” system (much like what Microsoft tried to do) will let members leave comments on third party sites –as well as identify their friends on these sites. Facebook Connect allows applications, devices, websites to allow third party sites to embed a small piece of code on your site. Then, as users come to your site, (assuming they are Facebook users) could login to Facebook from your site and choose to share activities that would be shared on their newsfeed on Facebook. Interestingly, I talked to some Facebook employees, and they weren’t even looking as far as I was, (which means I’m doing my job well) so this prediction is something to still watch. Brands should watch how this impacts the few launch partners first, let them sort out the bugs, and put this on the roadmap. Brands that have websites that have social actions (such as buying a product, rating, ranking, or leaving comments) should keep this in mind, as they can now extend the actions to Facebook streams. Brands that are already trying to reach the Facebook audience (white collar workers and college students) should plan on experimenting with Facebook Connect as it can bring additional social functionality to corporate websites. First, start with use behavior: Use this interactive chart, the behavior is a cross between “Joining” (a social network) and “critic” (commenting, voting, rating) content. In this case, joining is a prerequisite for being a critic, so the actual participation level will be less. Your logins could become less relevant if Facebook adoption continues to take off in particular markets, for example, brands that are already trying to reach this segment should be ready to adopt Facebook Connect. I ran this Tim O’Shaughnessy, CEO Living Social, who agreed this is a big change. Update: After talking to others, like Dave McClure, it quickly was realized that this is just one more in a trend: OpenID now on MySpace, Google Friend Connect, LinkedIn’s ties with Businessweek and NYT are all examples of our social graphs (relationships) leaving the social network and spreading to third party sites. Also, White label social network vendors (community platforms) should be thinking about how to integrate all of the above.